Bet Labs can be an invaluable tool in creating historically profitable betting systems, but we are often peppered with questions regarding how to go about creating a winning system. With dozens of filters to choose from and thousands of games included in our archived database, there is no shortage of information. But what characteristics should be considered when creating your system? When dealing with statistics and betting trends, it is essential that your betting system has a significant sample size which accurately represents the data as choosing a sample size that is too small may not give an accurate representation. Large sample sizes allow you to more accurately observe advantages that you may hold over the sportsbooks. With Bet Labs, users are able to easily create winning betting systems with significant returns i.e. a large number of units won and a high return on investment. However, oftentimes this system will include one or two highly profitable seasons which frequently occurred many years prior. When we see this type of downwards regression, it is typically an indication that bookmakers have adjusted their lines to account for this previously held advantage. That means the edge sports bettors used to hold no longer exists. Instead of looking for an inconsistent system with one or two huge seasons, you would prefer to find a system with consistent year-to-year gains. That should give you more confidence that your edge will continue to exist in following seasons. The featured image of this article (shown at the top of the page), is taken from our NFL Bye Week system and an example of a graph with consistent results. Try Bet Labs for $25 and create your own winning betting systems today! Frequently, we come across betting systems in which a customer has completely custom-fitted their data to produce a betting system with a high number of units won. Oftentimes, users will create systems that focus on very specific data points that have been profitable as opposed to looking at a full range. For example, knowing that teams receiving less than 30% of public bets is valuable information, however, if you only examined the specific data points (i.e. 17%) with the highest units won, you could create a system with a greater ROI but you wouldn’t have learned anything particularly valuable – especially considering that the public betting percentage could move a single point after placing your bet, thus falling out of your system. 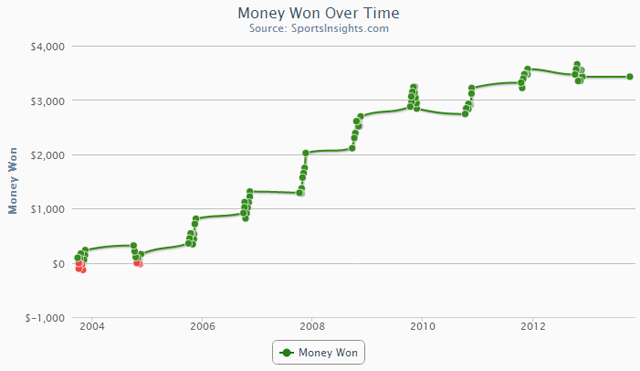 Should You Bet an NFL Spread of +2.5 or Take the Moneyline? I see your try it for $25 but it does not offer anywhere what the term is? How long do you get to try it for for $25? Here’s the text from the $25 trial membership page: “Your membership will automatically renew once your trial commences. At that time, your membership will be charged the current monthly rate.” So it’s not really a $25 dollar 6 day trial. They will charge your card $25 + the current monthly rate depending on the plan you choose (either $49, $149 or $249). So when you sign up for the 6 day trial you will be charged either $74, $174 or $274, which will give you approximately 36 days of service (6 days + one month). The way our trial works is that you will automatically be billed $25 and have access to our Bet Labs software for 6 days. If you decide not to cancel your account during that trial time, you will be billed the monthly rate of $99/month at the end of your trial. I apologize for the phrasing, and that text has been updated on our membership page.